Waiting for the great leap . . . forward? You mean, we’re all going to turn into Johnny Depp? No thanks. 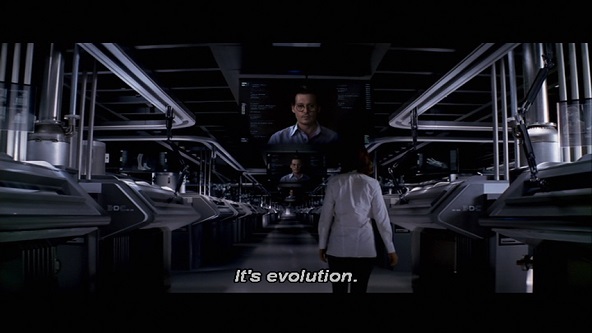 Over at Alex on Film I’ve been watching a bunch of SF movies dealing with the next step in humanity’s evolution. What surprised me the most was how upbeat and apocalyptic the response seemed to be to this. There’s nothing to be frightened of because it will be something truly incredible: the tipping point where we become as gods in the Singularity or digital rapture. I wanted to include my thoughts on Demon Seed just to provide an example of what an earlier generation (my own) thought about the wedding of humanity with our technology. In any event, I once again got more political than I probably should have, but that’s the fun part of having a blog. Here are the films I looked at.